Sterile Avant gauze sponges made from 4 ply rayon and polyester. Measures 4" x 4" and is manufactured by Medline. Latex free. Comes 2 per pack and 50 packs per box. 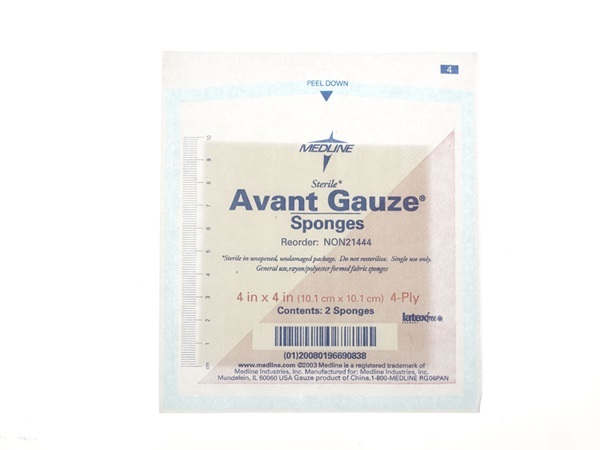 Compared to traditional cotton gauze, Avant Gauze helps to reduce the amount of lint that is produced and is less traumatic to fragile granulating wound tissue because it's virtually non-adherent. 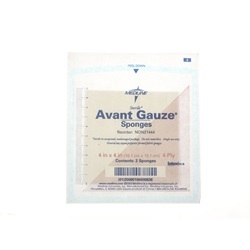 Avant Gauze is Medline's standard non-woven dressing. It also has significantly faster wicking ability which promotes a healthier healing environment. Discover the perfect balance between strength and absorbency in this rayon/polyester blend gauze.